What’s All The Fuss About Wheat? Everyday at least 2 and sometimes as many as 10 people will ask about the effects that wheat may or may not be having on their health. Wheat is one of the most prolific and over used ingredient on our planet. It is estimated that 4 out of 10 people have wheat sensitivity. So why has this seemingly benign plant that has sustained generations of humans suddenly the bad guy? In order to get the full flavor we have to take a look at the history of wheat in our culture. When I was growing up you could drive through farm country anywhere and see miles of four-foot high amber waves of grain flowing in breeze. Today they are whopping 18 inches high. This is due to the immense genetic changes that wheat has undergone in the last fifty years. Wheat has been genetically modified, hybridized, cross-bred and introgressed to make the wheat plant resistant to environmental conditions such as drought, diseases and fungi. All of the changes have been beneficial in terms of the increase in yield from each acre and there is a significant reduction in diseases affecting the plant. Each acre now yields about ten times the yield of the same acre in the past, which has been very benefit to developing countries with limited available land for farming. Scientists were so intent on increasing the yield of a crop that there were no animal or human safety tests conducted or required on the new strains that were created. After all it looked, performed and tasted just like wheat and that seemed to be enough. The problem is that each time a new modification of wheat occurred 95 % of the protein expressed in the offspring were the same but 5% were unique and not found in either of the genetic offspring. Our body does not recognize these unique proteins and see them as foreign invaders. Small changes in the structure of wheat will lead to a significant immune response to wheat protein for some and for others no response at all which is what creates part of the confusion. Your response depends on your genetic make up, sensitivity and the strength of your immune system to respond. Wheat is also found in foods that you wouldn’t even consider which further magnifies our exposure to these protein molecules. It is found in salad dressings, canned and commercially prepared soups, instant drinks, condiments such as soy sauce, Worchester sauce, teriyaki and horseradish sauce and ketchup. Additionally it is found in dips, gravy mixes, luncheon and prepared meat patties, beer as well as synthetic and imitation chesses. This is not to mention the cakes, pastas, cereals and breads that we expect to contain wheat. So you can see wheat is everywhere and our bodies constantly have to deal with the bombardment of these protein molecules and some of use deal with it better than others. Wheat sensitivity can present in many ways other than the traditional bloating, flatulence and bowel irritability that we commonly associate with food sensitivity responses. Wheat sensitivity causes an inflammatory response, which in turn lends itself to rashes, joint pain, asthmas symptoms, migraines, lethargy, cloudy thinking, sleep disturbances and many other symptoms. 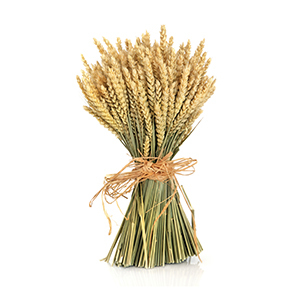 Consider trying an experiment with yourself and eliminate wheat from your diet for two weeks. If you have sensitivity to wheat you should be able to see a difference in that period of time. In order for it to be a viable experiment you will need to eliminate all wheat from your diet, which necessitates reading labels and avoiding many processed foods. For a more in depth understanding of wheat and its effects consider reading Wheat Belly: Lose the Wheat, Lose the Weight, and Find Your Path Back to Health by cardiologist Dr. William Davis. It is an easy read and very informative. For you convenience you can click the link above or you can find it on my website gibsonchiropracticclinic.com and click on the recommended reading tab.